Back by popular demand welcome in the New Year with Solos on a snow-filled activity holiday in Finland. Combine the fun of snowmobiling, sleigh rides with huskies, horses and reindeer with bringing in the New Year at a gala dinner with fireworks and dancing into the early hours. Our destination for our New Year celebrations is the Wild Taiga region of Finland. The region is a wonderful destination for winter activities (with eyes peeled for the Northern Lights) and famed for its wildlife, some of which is now either extinct or incredibly rare elsewhere in Europe. Its geography is dominated by hills, forests, lakes and rivers, which are home to moose, reindeer, and large carnivores including the brown bear, wolverine, grey wolf and lynx. From our perfect winter wonderland setting, we set out on our first day to explore the Taiga Forest and frozen lake by snow-shoe. Our guided walk will not only let us take in the natural beauty of the area but we will also learn a new skill. 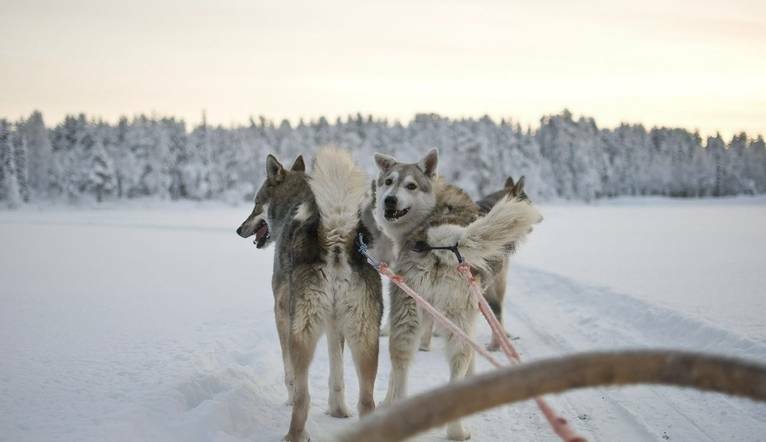 We spend our second day in beautiful Lapland discovering the best way to travel in Finland – by sleigh! Our taster sessions will give you a chance to try out horse, husky and snowmobiles. Our third activity day is a switch from horses to horse power with a day of snowmobiling! Together we will drive along Taiga Forest, stopping by an open campfire for a refreshing and warming drink. All these activities are part of your exhilarating trip, including use of skis, kick-sledges and sledges for the whole week. Our New Year celebrations will bring in 2018 with a bang! Our hotel will host a Gala Dinner, but before the party starts you have chance to look into what the coming year holds for you with a Finnish New Years tradition of tin casting with ‘Ms Fortune-teller’. The party continues with a DJ and fireworks to mark the moment we enter 2018. After all our daytime activities, what we’ll need are nice relaxed evenings and that’s exactly what’s on offer at our hotel! On returning from our days of adventure you have access to the onsite sauna and Jacuzzi to relax your aching muscles. Or brave the cold for a lake-side sauna – immersion in hot water followed by a leap into the lake; not for the fainthearted. A fairy-tale holiday and a dream come true! Magical snowy environment with like-minded people and a great choice of activities. Northern Lights sighting cannot be guaranteed. The transfer time from Kuopio Airport to the Hotel Kalevala is approximately 2.5 hours, depending on weather and traffic. We include: snow-shoeing in the Taiga Forest including hot juice (2 hours approx), horse sleigh ride, short husky dog sleigh ride, reindeer sleigh ride and a taster snowmobile sleigh drive with hot juice. 1 hour reindeer sleigh drive. Snow mobile safari (2 persons per snow mobile) including thermal clothing. New Years Eve celebrations including Gala Dinner, fireworks, fortune teller & disco. Free use of kick-sledges, sledges, DVDs, Playstation 2, Wii games. Free Wifi. Listed below are a few of the possible optional tours which may be on offer to you during your holiday. The prices and full details of all the tours will be given at your Information Meeting as the prices will be dependant on the number of people wishing to take the trip. Your Tour Leader will book the excursions for you but may not necessarily accompany you. We suggest a Group Collection to cover transfer drivers, and hotel staff of €25.00 per person. Your Tour Leader will collect this on your behalf and distribute it accordingly, thus relieving you of the burden of who, when and how much to tip. The tipping of housekeeping will be left to your individual discretion (a small amount left in your room on departure should cover this and would be much appreciated). As is customary, ‘the hat’ will be passed around for the driver and guide on all optional excursions. For any meals that are not included in your itinerary, or taxi fares, your Tour Leader can advise of an appropriate % to add on.